Most of our caloric intake comes from snacks or light meals, such as milkshakes, donuts sprinkled with sugar, chocolate, candy, ice cream, sweet biscuits, soft drinks, waffles, cakes, and more. Some examples of the above is the kind of snack that contains calories and is often consumed by both children and adults. Various kinds of these foods can cause problems such as tooth decay, diabetes, obesity, a growing body weight or other health problems. It is encourages people to change their eating habits and begin to look for low-calorie options both in the food, beverage, and snack. Make a mixture of almonds, pistachios, walnuts and peas (6 to 7 nuts each), mixed with some raisins and dried figs and enjoy a healthy snack crisp. Nuts are a source of essential fatty acids, minerals and vitamins, while raisins and figs are rich in antioxidants snack. Most people seem to avoid eggs for fear of cholesterol, but this is just a myth. Eggs not raise LDL cholesterol (bad cholesterol), but it gives good cholesterol is important for the metabolism of fat. For adults, eating eggs one or two eggs a day will not give any problem. We can make a veggie omelet, egg sandwich, boiled egg salad, or just eat fried eggs. Bananas, apples, mango, melon or watermelon to enjoy a delicious snack of fruit. We can also enjoy oranges, grapes, plums or fruits rich in vitamin C (do not mix with sweet fruit). 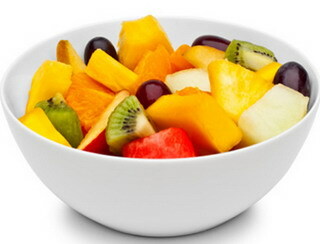 Eating fruits will make us feel full, fresh, and energetic. The fruit is rich in minerals and vitamins that contribute to health in general. We can make a salad with ingredients tomatoes, cucumbers, cabbage, carrots, beans, bean sprouts, cabbage, and lettuce water. We can add to this salad dressing made ​​of lemon, vinegar, and soy sauce. If we do not like raw vegetables, we can bake potatoes, artichokes, and sweet potatoes, roasted vegetables to make a delicious salad. We can get some cheese with good quality food stores, or specialty stores that sell organic food. The cheese is a healthy food that is rich in minerals, vitamins, and essential fatty acids. We can eat a single slice of cheese as a snack, or a meal with some whole wheat bread, or a salad vegetable. It's easy to get canned tuna (just make sure it's low sodium). Tuna is a rich source of protein and essential fatty acids, in addition to low-calorie, tuna is one fish was very tasty. Tuna will surely be one of the snacks that are healthy and delicious without sugar. Some of the food above is a list of low calorie healthy snacks that are affordable and easy to prepare. All these foods are rich in minerals, vitamins, and enzymes needed by the body, but low in calories.